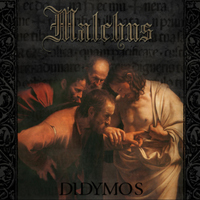 Malchus hails from Poland and they have prior to this release done four demos and played a lot of local shows. "Didymos" shows a band that tries to unite heavy guitar sounds with technical keyboard playing, sort of combining Dream Theater with Opeth, and only with some success. The song writing and technical level is not quite where you would expect a new, recording band to be and they do try to bring something unexpected to the platter without much success. But in their defence everything is totally ruined by a horrible and poor production, which makes it very hard for the listener to pick things apart.